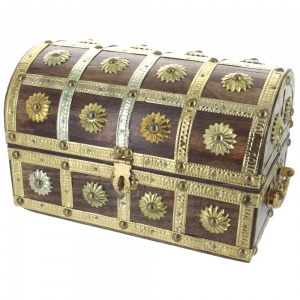 Half Round Box With Brass - Medium (height 13cm, width 13cm and length 21cm). Beautiful polished wooden storage chest with decorative brass strips and designs. Interior of the box is lined with red fabric. This attractive item would look delightful in any home or make an ideal gift.